$95 for a one year subscription to our Catholic weekly. (Thats less than $2.00 a week for the nations oldest Catholic weekly). 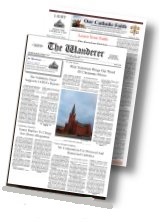 The Wanderer print edition is celebrating it’s 150th year in the Catholic press this year. We publish our print edition each Friday of the week. Your source for weekly Catholic news and commentary. Catholic, conservative, orthodox, and loyal to the Magisterium. Published 52 times a year.